A Look At The Worst Wildfires In Colorado HistoryTake a look at some of the worst wildfires in Colorado's recorded history. CSU Researchers Using High-Tech Plane To Study WildfiresA cargo plane loaded with a million dollars worth of equipment and Colorado scientists is prepped to study wildfire smoke. Specially Trained Firefighters Come To Aid When There's TroubleWhen a wildfire sparks in Colorado, fire crews go to work; saving homes and sometimes lives, putting their own lives on the line. Suspects In Lake Christine Fire Want Trial Moved Out Of Eagle CountyTwo people who pleaded not guilty to starting a wildfire in western Colorado last summer want their trial moved out of Eagle County. They started the fire by firing incendiary tracer rounds at a shooting range. Tiny House Fire 100 Percent Contained, Evacuation Orders LiftedThere was little growth of the Tiny House Fire in Boulder County overnight. Firefighters say no structures were impacted by the wildfire. Evacuations Ordered As Wildfire Burns In Boulder CountyA wildfire was burning in St. Vrain Canyon in Boulder County on Monday afternoon. The fire was burning near Highway 7 between Lyons and Allenspark. Fire Crews Battle Wildfire Burning In Southeast ColoradoFire crews continue to battle a wildfire burning in Las Animas County. Bent County Brush Fire At Almost 1,500 Acres; Evacuations LiftedThe blaze did calm down overnight and was estimated at 50 percent containment Saturday morning. At sundown the day before, there was no containment. 416 Fire: Wildfire Investigation Taking 'Longer Than Expected'Federal officials say an investigation into a wildfire that torched land in southwest Colorado is taking "longer than expected." Orphaned Bear Cub Burned In 416 Fire Now Released Into The WildAn orphaned bear cub burned by a Colorado wildfire has been released back into the wild. 2 Plead Not Guilty To Starting Lake Christine WildfireTwo people accused of starting a wildfire in western Colorado last summer by firing incendiary tracer rounds at a shooting range have pleaded not guilty. 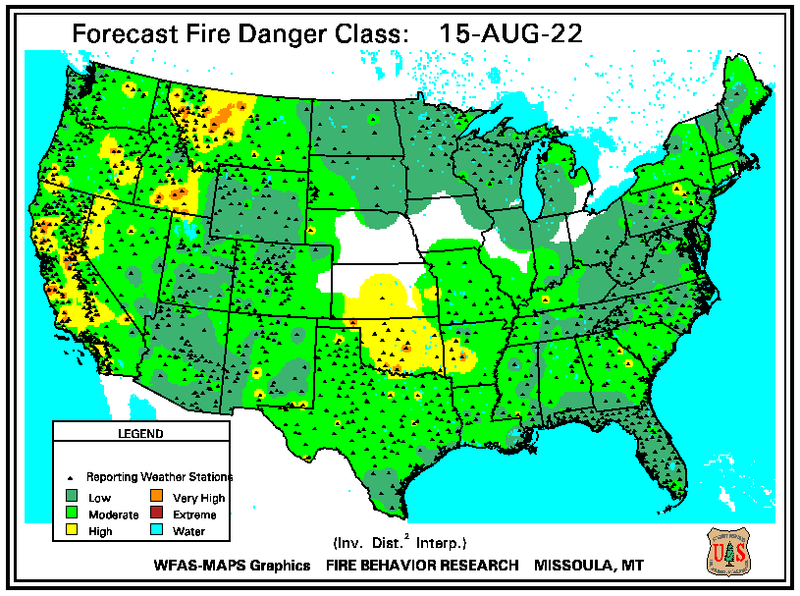 Fire Danger ForecastCheck the latest U.S. Forest Service's fire danger outlook. ColoradoWildfireRisk.comThe website ColoradoWildfireRisk.com can help you assess the wildfire risk at your home. The site is an effort from Colorado State Forest Service. U.S. Drought MonitorOn a special page of the U.S.'s NIDIS website, you can track weekly drought conditions in Colorado. Firewise.orgThe website Firewise.org can help you make your community safer from wildfires and teach you other preparedness tips. Significant Wildfire OutlookThe predictive services group at the National Interagency Fire Coordination Center takes a look at wildfire risk for the next few months around Colorado and the United States. Historic Colorado Wildfire Changed American Fire PolicyIn 1994 rapidly growing wildfire on Storm King Mountain claimed the lives of over a dozen fire fighters. Past Wildfires Guide Governor To Better Protect ColoradoSeeing a wall of flames consume dozens of home prompted quick action. Digging Into The Science Behind Weather & WildfireThere are several factors that go into feeding a wildfire, but they almost all tie back to one very important weather variable. A Coordinated Dance To Fight Wildfire From The SkyWhen a wildfire breaks out, it takes an incredible amount of coordination to fight the flames, both on the ground and in the air. Neighbors Take Bold Stand To Fight Against Future WildfireThis group of neighbors from the Black Forest gives new meaning to "it takes a village." Mitigating Against Wildfire Is More Than Cutting Down TreesIt turns out that some of the smallest details, such as in landscaping, can help protect your home from the flames of a fire.